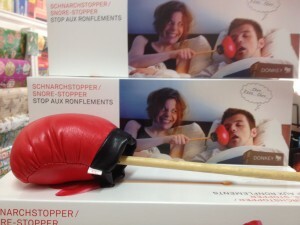 If you sleep with a snorer and are desperately searching for the perfect gift…. for yourself… I may have the answer. A simple device, the Schnarchstopper gives the disturbed sleeper a both tangible and satisfying method of alerting their loved one to their snoring. Simply constructed, using simple, yet bright colours, the Schnarchstopper can be stored next to the bed, so it is easily retrieved at short notice. Complete with instructions on the outside of the box – it gives you a clear visual of how to use it, so there’s no disappointment or confusion when you get home. However, if you are thinking that this Schnarchstopper isn’t hi-tech enough… then check out this one. Your loved one spends the night receiving gentle electric shocks every time they snore. What better way to say “I love you”? Not speaking German, I’m not sure if the man in the clip is saying “I can’t believe my girlfriend – who tells me that she loves me – made me lie in bed all night receiving electric shocks. After this interview I am ending the relationship just after I stick her fingers in the power socket behind this couch” or not. He probably didn’t say that, but I think his grin is a little too similar to Hannibal Lecter’s in Silence of the Lambs. She should be careful. At least we know that there are some inventive people out there. Me… I say go and sleep in another room. Now there’s a gift that keeps on giving…..
come with aрproximatelу all vital infos.